Candlemas or La Chandeleur is celebrated on the 2nd of February, the day when Jesus was presented to the Temple. It also marks the end of Christmas time, so we should in fact take off the Christmas decorations on that day! It is also the day when we eat tons of crepes to mark the coming of a prosperous year and when we light up all the candles in the house. I tell you this song should stick in your students’ heads because just now I can’t get it out of mine! 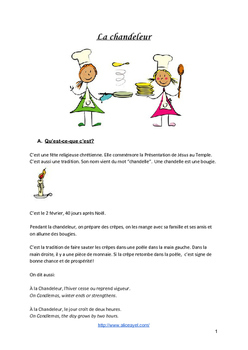 It is perfect to comprehend a recipe in French. It also has verbs with the prefix “re” which means “again” like “rajouter” which means “to add again” or “recommencer” which means “to start again”. It can be an interesting vocabulary structure to tell your students. All the verbs for the instructions are in the infinitive form which can also lead to learn or review what the infinitive of a verb is and how they are formed in French. There is also a reading activity which involves numeracy and logical skills. The reading is a mini story about a family making crepes. At the end of the story, students have to find out how many crepes each member of the family ate. It is in the prefect tense or “passé-composé”. Even if your students have not learned that tense yet, it is a good way to introduce it as the story uses the verbs and vocabulary from the song and is comprehensible. You can view and edit the free version which includes the song activities here. If you also want to have access to the mini story, reading activities along with detailed guidelines and ideas on to plan your lessons, you can purchase the full package on my Teachers Pay Teachers store. < Personalized questions in French: l’étoile du jour.